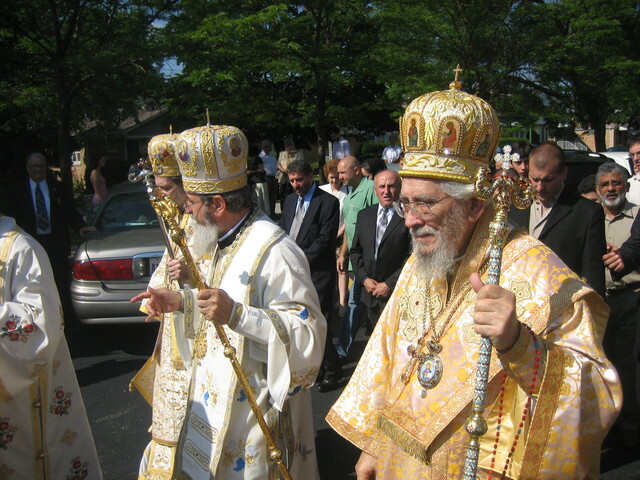 Never has a Congress of the Romanian Orthodox Archdiocese in the Americas been awaited with more excitement than the 76th bi-annual Congress, hosted at the Archdiocesan Center in Chicago, Illinois on July 4-6, 2008. In addition to the ordinary business of the Congress, the most important topic was the presentation, explanation, and discussion of the 20 articles comprising the “Proposal to Establish a Romanian Orthodox Metropolitanate of North America”. At the same time, nothing could have been more carefully and lovingly prepared for the conclusion of the Congress than the Consecration of the Archdiocesan Cathedral. 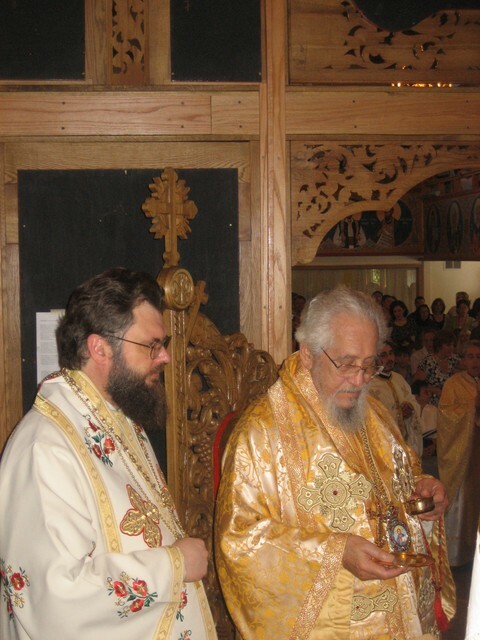 The Congress began on Friday morning with the Hierarchical Divine Liturgy, con-celebrated in the Sts. Constantine & Helen Cathedral by Metropolitan Laurenþiu, Archbishop of Sibiu and Metropolitan of the Ardeal, and Archbishop Nicolae, Archbishop of the Romanian Orthodox Archdiocese in the Americas. Afterwards we sang ''Memory Eternal'' for our hierarchs of blessed memory: Bishop Policarp, Bishop Andrei, and Archbishop Victorin, for whom we observed the memorial for the 7th year since his passing on July 16, 2001; as well as for the clergy of our Archdiocese and the founders of the Cathedral who have passed on into the presence of the Lord through the years. The Panahida was followed by the Consecration of the Troitza in front of the Cathedral, and then by a Te Deum Service for the American Independence Day as well as for the opening of the Congress. The hierarchs, together with the priests, delegates, and faithful who were present asked the Good Lord to bless the work of this Congress. Following the noon meal there was an “Anniversary Moment” dedicated to the first Bishop of the Romanians in North America, Policarp Moruºca. In 2008 we are commemorating the 125th anniversary of his birth, as well as the 50th anniversary of his death. The anniversary presentation was given by Mr. Radu ªerban, Diplomat from the Romanian Ministry of External Affairs, who is a grand-nephew of Bishop Policarp (his grandfather and the Bishop were brothers). Around two o’clock in the afternoon, the Congress was opened by Archbishop Nicolae with a welcome message, inviting everyone to visit the museum dedicated to Archbishop Victorin, organized in the Conference Room of the Center. After attendance was taken, with over 80 delegates present, the agenda was approved and the various commissions were constituted (credentials, parish reports and proposals, nominating, etc. ), as well as the secretariat of the Congress. Then the assembly began its actual work. The minutes of the 2006 Congress were approved. Greetings were read from His Beatitude, Patriarch Daniel of the Romanian Orthodox Church, and His Eminence, Archbishop Nathaniel of the Romanian Orthodox Episcopate of America, these messages being received with applause by the delegates. Following these discussions, Archbishop Nicolae presented his activity report, detailing his canonical visits as well as various inter-Orthodox and ecumenical meetings in which he has participated over the past two years. His Eminence also spoke about the meetings of the Eparchial Council and the Deaneries, which had taken place for the first time as per the provisions of the new Statutes, adopted in 2006, and also about new missions and newly received clergy in our Archdiocese. After His Eminence’s report had been received with much enthusiasm, the report of Auxiliary Bishop Ioan Casian was read. The new accomplishments of the Eparchial Center were brought to the attention of the delegates by Archbishop Nicolae, as well as the importance of this Congress for the future of Romanians in North America. The delegates received these reports joyfully, both for their complexity and for the pastoral care and love shown toward the faithful of our Archdiocese in the past two years by Archbishop Nicolae and Bishop Ioan Casian through their tireless efforts. Friday’s final session was dedicated to discussions and approval of the Clergy Compensation Guidelines. The necessity of this document as a reference point for our parishes was affirmed. Accentuating the fact that the nature of the document is that of a guideline, all those present, the delegates and priests, expressed their appreciation for the efforts of Alexandru Suba and George Popa in putting together such a document, which we trust will be brought to fulfillment in the next few years in all our parishes. Providing a means of analysis and responses to many questions which have been raised in our parishes in recent years, the Clergy Compensation Guidelines were appreciated as a useful document for the parishes. This first day of the Congress ended with the evening meal. The evening was set aside for a meeting of the clergy with Archbishop Nicolae and the delegate of His Beatitude, Patriarch Daniel, to the Congress and Cathedral Consecration, in the person of Metropolitan Laurenþiu. The meeting was opened by Archbishop Nicolae, who thanked Metropolitan Laurenþiu for his presence and delineated some of the current pastoral-missionary problems of our parishes. At Archbishop Nicolae’s invitation, Metropolitan Laurenþiu spoke about Orthodoxy and the liturgical life of the Romanians living on the North American continent, this being appreciated by all those present at the meeting. Following the closing words by Archbishop Nicolae, some directions were given regarding the Consecration Service for the Cathedral on Sunday morning. On Saturday morning, July 5, 2008, Archbishop Nicolae opened the next Congress session with a word of welcome for the newly arrived delegates. Then Fathers Ioan Ioniþã and Nicholas Apostola read the “Proposal to Establish a Romanian Orthodox Metropolitanate of North America”. The official correspondence between our Archdiocese and the Romanian Orthodox Episcopate from the Vatra was then read. The words of Archbishop Nicolae and Archbishop Nathaniel were received with applause and enthusiasm by the delegates. Father Apostola brought out the fact that the proposal for unification and the creation of this document by the Dialogue Commission, made up of 5 priests from each eparchy, was the result of over 15 years of struggle in this direction. This document describes, in general terms, how the future Metropolia for Romanians in North America will look, as well as the relationship of the Metropolia with the Mother Church, the Romanian Patriarchate. Following discussions and explanations, the document was adopted with applause and a standing ovation as a sign of respect for this historic moment in which we were participating. Archbishop Nicolae cautioned that this document is a step forward, but there are still many others to be taken: the creation of new Metropolitan Statutes and preparation of a united Congress for the election of the Metropolitan of the unified organization. The decision of the Congress gives the Dialogue Commission the freedom to move ahead on the path to unification and the preparation of new Statutes for the future Metropolia. After a short break, His Eminence brought to the attention of the delegates the remaining points on the Congress agenda. Then followed the discussion and approval of two very important documents for the good juridical organization of our Archdiocese. The first was a Conflict of Interest Policy, referring to the problem of relationships within our Parish Councils or other governing bodies of the Archdiocese. Prior to its adoption, the legal responsibility of those involved in the administration of our Archdiocese, Deaneries, Parishes, and Monasteries, was stressed. The second document discussed was the Sexual Misconduct Policy, regarding the prevention and treatment of cases of improper sexual conduct, a very important issue in the light of the world and times in which we are living. The principal motive for the adoption of such a document is the prevention of any kind of sexual abuse or deviant behavior in our parishes; it also provides procedures to ensure justice and pastoral care in such delicate cases as can occur. Both documents were approved. Then Leonard Von Rommel and Sam Erina presented the financial reports for the United States and Canada, the reports being approved by the Congress. During the noon meal, a humanitarian presentation was made by the organization “Hospices of Hope”, with projects in Romania and other Orthodox countries. The final session of the 76th Archdiocesan Congress followed. Fr. David Hudson and Leonard Von Rommel were invited to present the report of the Department of Publications. They began by presenting the new web site of the Archdiocese. They went on to explain the problems of time, participation and money which have negatively affected the performance of this department. Several suggestions were made by the delegates in the hope that the future will bring better results. After this, short presentations of the annual Deanery Meetings were made by each of the Deans, highlighting the positive contribution which these meetings have made toward the homogenization and uniting of our parishes. Fathers Gherman and Bâzgan then presented the parish reports, with the sincere hope of a better cooperation in the sending, completion, and importance of such reports for our Archdiocese. The AROLA report followed, given by Theodora Miller, the new president of our women’s auxiliary organization. After presenting the new leadership committee, Ms. Miller brought to the attention of the Congress several of the principles and projects which AROLA will pursue in the coming years. Likewise, new AROLA Statutes were joyfully received in the hope that they will be understand and accepted at the parish level. Ms. Miller’s and AROLA’s presence and desire to work gave us all encouragement to sustain their efforts in the future. Miss Ioana Pop then presented a wonderful report for ROYA, showing the accomplishments over the past two years of our Archdiocesan youth organization. Miss Pop’s words were received with applause and profound appreciation in the hearts of all. Those present felt that there is great hope for the future of our Archdiocese in the hands of these young people. Following the recommendation of the Nominating Commission, the following persons were elected by the Congress to the Eparchial Council for the next two years. Clergy: Fathers Ioan Ioniþã, Daniel Adrian Ene, George Bâzgan, and George Sãndulescu. Laypeople: Elena Bront de Avila, Elena Manole, Leonard von Rommel, Alexandru Suba, Sam Erina, George Popa, Willis Toma and Iulian Hurba. Together with these newly elected Council members are the ex officio members, in accordance with the Statutes. Fr. Nicholas Apostola was appointed Vicar, and Fr. Daniel Ene Secretary of the Eparchial Council. 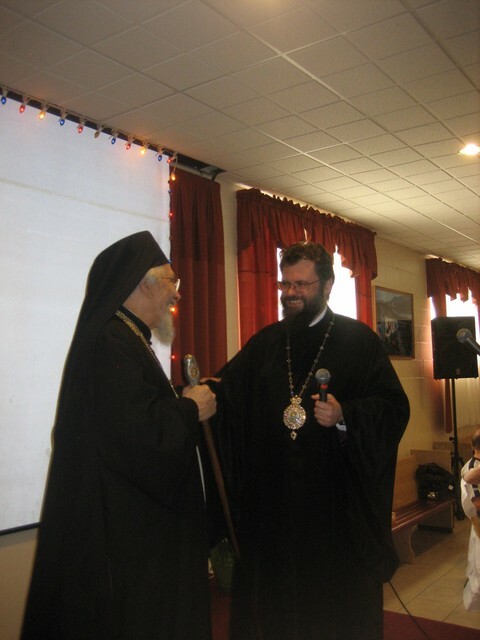 Also at the proposal of His Eminence, a new Eparchial Consistory was elected, with Fr. Victor Malanca as president, Fr. Nicolai Buga as secretary, Fathers Iulian Aniþei and Lucian Puºcariu as clergy members, and Alexandru Suba and George Popa as lay members. Before the conclusion of the Congress, while the decision of our brethren from the Romanian Orthodox Episcopate of the Vatra was being awaited, His Eminence reminded us of the historical importance of this Congress and all of our responsibility as we returned to our parishes after the Congress. Then our hierarch thanked Metropolitan Laurenþiu for his inspired words during the days spent with the delegates of our Archdiocese. He also thanked all the delegates for the sacrifice they had made in order to participate at the Congress. The meetings concluded on a note of joy brought by the news that our brethren from the Vatra had also voted for the continuation of the process of unification. The delegates then transitioned to the Vespers Service, with the preparation of the Holy Relics which would be placed in the pedestal of the Holy Table at the Consecration Service. On Sunday, hierarchs, priests, and hundreds of the faithful gathered together for the Consecration of Sts. Constantine & Helen Cathedral in Chicago. 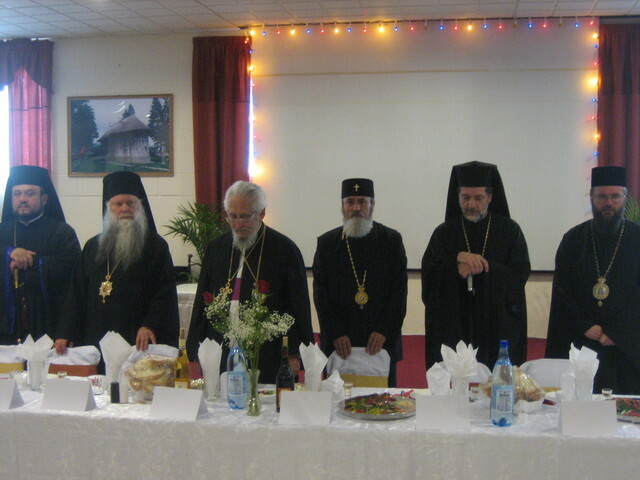 Along with Archbishop Nicolae, Archbishop of the Romanian Orthodox Archdiocese in the Americas, the hierarchs who concelebrated were Metropolitan Laurenþiu, Archbishop of Sibiu and Metropolitan of the Ardeal, Metropolitan Christopher of the Serbian Orthodox Church in America, Metropolitan Nicholas of the Greek Orthodox Metropolis in Detroit, and Bishop Irineu Duvlea, the Vicar Episcop of the Romanian Orthodox Episcopate in America. Also present were their Excellencies, Mr. Lucian Leuºtean, Romanian Consul General in Chicago, and Mr. George Predescu of the Romanian Embassy in Washington, DC. Over 60 priests from our Archdiocese as well as the Episcopate from the Vatra served together with the hierarchs, and hundreds of Romanian faithful from this great American city lifted their voices together in the Divine Liturgy. The Congress program concluded with a festive Banquet organized by the wonderful family of the faithful of Sts. Constantine & Helen Cathedral, who had labored throughout the week to insure the success of the 76th Archdiocesan Congress. At the banquet Bishop Peter of ROCOR joined the other hierarchs. As we departed, each of us sensed the providence and blessing of our Savior Jesus Christ which had been poured out upon us during these historic days.